HORAN Capital Advisors Blog: Are Investors Really Holding A Lot Of Cash? Are Investors Really Holding A Lot Of Cash? An article making the rounds on the internet this weekend is one that appeared in the New York Times on Friday, Fear of Equities Drives More Investors to Cash. The article cites a State Street (STT) study titled, Stashing Cash Under the Mattress. An important footnote in the study notes the asset allocation question is referring to what an investor is doing with their monthly 'saving/investing' budget. From the study, survey participants indicated they were placing 44% of their monthly funds into a 'savings/checking' account. The study then presents a table showing investors are allocating 44% of their budget to cash, to which the New York Times article notes the survey participants are fearing equities. The remaining 56% allocation of one's budget is being placed in a broad array of investment categories. That is a high percentage one is placing into the market. I am presuming the 44% savings/checking" budget allocation is likely being used to support one's spending desires. Do overall cash levels in the market actually support the survey and Times conclusions? 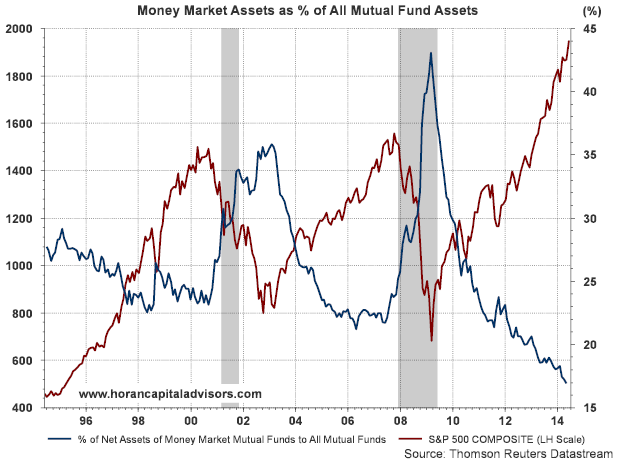 As the below chart shows, money market assets as a percentage of all mutual fund assets are at the lowest level going back to the mid 1990s. Additionally, Forbes cites the AAII April Asset Allocation Survey noting cash allocations reported by investors stand at 17.4% which is below the long term average of 24%. Coincidentally, the below chart using ICI data shows a similar percentage. In reviewing the most current allocation percentages for the broad investment categories from the Investment Company Institute (stocks, fixed income and money market assets), the below chart indicates investors, as a percentage of all mutual funds, are most overweight in bonds/fixed income investments. As a percentage, equities remain below the level just before the onset of the financial crisis at the beginning of 2008. Maybe investors are saying one thing and actually doing another; however, it does appear investors are not sitting on piles of cash. In fact we wrote a recent post in early May, Are Mutual Funds Preparing For A Correction? Is it possible fund companies are seeing investors' actual behavior is far from a fearful one? 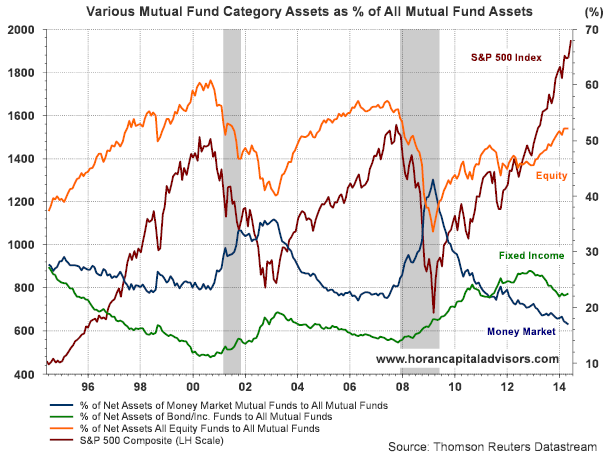 For the first (top chart), does % of net assets of money market mutual funds to all mutual funds factor out the price change in the funds? The money market to fund % is an inverse relationship to S&P 500 composite. If you have $20 money market and $100 in all mutual funds, this would show 20% money market to mutual fund. If the mutual fund performance doubles (to $200) and money market allocation has not changed ($20), the % asset if money market to fund would be 10%, $20/$200. Just a thought though, for stock prices to increase, there does need to be demand.